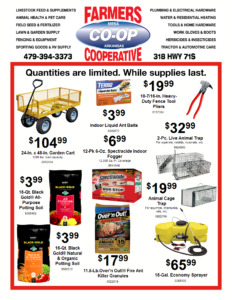 Stop by the Mena Farmer’s Co-op to take advantage of our February Doorbuster Specials. Save on products for your garden, pest control, and hardware all month long. Gardening season is coming! 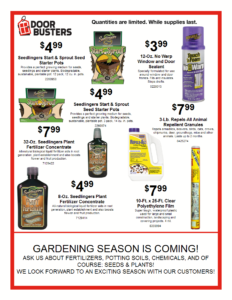 Ask us about fertilizers, potting soils, chemicals and of course seeds and plants. We look forward to an exciting season with our customers here at Farmers Coop at 318 Hwy 71S in Mena, Arkansas. 10-7/16In. Heavy-Duty Fence Tool Pliers – just $19.99. February Doorbuster Specials are available only at the Mena, Arkansas location, while supplies last, quantities are limited. This entry was posted on Thursday, January 24th, 2019 at 4:12 pm	and is filed under Events, News & Updates, Promo. You can follow any responses to this entry through the RSS 2.0 feed. Both comments and pings are currently closed.